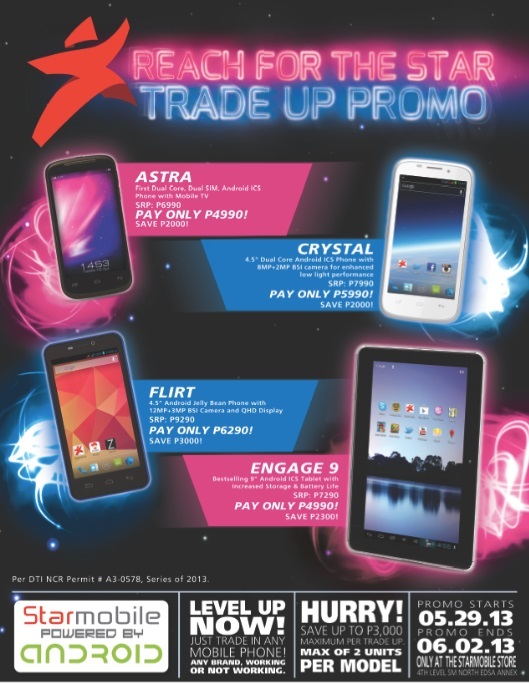 Home News Smartphones Tablets Save up to P3,000 with Starmobile Reach for the Star Trade Up Promo this May 29 to June 2, 2013! Save up to P3,000 with Starmobile Reach for the Star Trade Up Promo this May 29 to June 2, 2013! Starmobile just posted on their Facebook page a "Reach for the Star Trade Up Promo," where you can trade in any working, non working, or used phone of any brand and they will give you up to Php3,000 OFF on selected Starmobile Android phones and tablets. Promo runs from May 29 (starting 6PM) to June 2, 2013 only at the Starmobile Concept Store, 4th Level SM City North EDSA Annex! More details after the jump. For more info about the Starmobile ASTRA, just go here. For more info about the Starmobile CRYSTAL, just go here. For more info about the Starmobile FLIRT, just go here. For more info about the Starmobile ENGAGE 9, just go here.